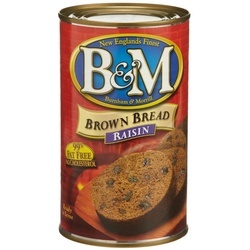 B&M Brown Breads are made in the can, the traditional New England way. The can is covered with waxed paper, foil or a small plate and then placed on a shallow rack in a pan, then covered and cooked in steam for approximately three hours. The result is a hearty, flavorful brown bread with a homemade taste.